Regrettably, the scientific miracles narrative has become an intellectual embarrassment for Muslim apologists, including myself. I hope he has not received any negativity and especially the violent rhetoric afforded to people that speak out on such matters as this is a massive statement to make considering he was such a high profile advocate and apologist for the scientific miracles in quran since its publication in 2013. Hamza Andreas Tzortzis was born 21st September 1980. He is an international lecturer who has lectured in many universities including USA, Australia, Netherlands, Malaysia, Canada and Lebanon. The lecturer has authored many books and articles on his personal blog. As a debater he has debated many popular professors including Professor Lawrence Krauss, Professor Simon Blackburn, Professor Ken Gemes and Professor and Dan Barker. Hamza heads up a team called iERA,(Islamic Education and Research Academy). Actually what is remarkable about the Quran is not only that it does not contain any contradictions , but in fact it seems to be making statements about history, theology, philosophy, law and the natural world that defies a normal human explanation.. It is easy to understand how the Creator would know about the common origin of the universe, the details of embryonic development and that mountains have roots but it is not easy to explain how Muhammad managed to include the information in the Qur’an unless we accept his claim to be a Messenger. It would seem that accepting this would be the most sensible thing for a rational, sincere person to do. In my opinion this publication needs to be revised to no longer include this. This has been for too long an argument used and still used by imam in the mosque or parent to child or proselytiser, and the bane of my life, the internet debater with no knowledge of the science they are attempting to talk about. Oh and lest we not forget Zakir “The Snake” Naik. I believe the same logic applied by Tzortiz can be levelled at the historical statements which are claimed could not be known. Why stop there Hamza? I don’t get the linguistic part. there is a part where Muhammed is asked to write a divinely inspired poem. It is rubbish. It keeps repeating the same line over and over again. This to me is the nature of the quran. Lots of filler statements regarding allah repeated over and over and over and over and over and over. The meaning and message of quran is much like, in fact almost cargbon copy of the fire and brimstone god of the Old Testament. His concept is straight out of OT also. Remarkable features? Not sure what they could be. Islamic rhetoric!! It speaks volumes that its greatest proponent will make such a statement however it seems very little positive effects because of this, apart from Tzortiz making things right publicly with the scientific community. 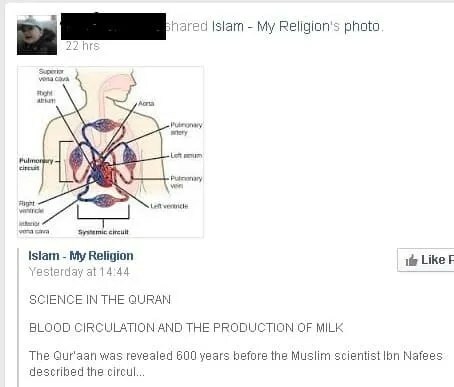 The debates mention quran’s scientific miracles still flow. His book is still available to download with no revision. The imams still preach it from the mosques and the young minds are still fed it at home and in madrassa. The islamic world seems to either have not noticed their chief proponent has made this u-turn or choose to ignore it. Why on earth would they do that? Is islam that weak that they can not embrace the fact that the quran contains no scientific miracles? I wonder whether the punishment for apostasy would apply to someone that was duped into accepting islam on the back of these purported miracles and have lost faith because they are no longer to be considered miracles? Also I got no apology for those duped or misled. All in all an effort was made but really a half assed attempt. We want an apology, we want a fatwah exempting anyone that leaves islam on the back of this revelation and we need the Red Underwear publication revised!! Until then my hat firmly replaced on my head and tipped gently to all readers….